You are here: Home / Blog / Where’s the Mistletoe? Hi everybody, it’s your old friend Mike Houlihan. Skinny and I send a great big fat Merry Christmas to each and every one of you and thanks so much for tuning into the new show. We started out of the gate a little rocky back in November but now we feel like we are back in our groove, talking about Chicago, chewing the fat around your kitchen table, and finding folks who are doing something positive in Chicagoland. The new show is even more fun than the old one believe it or not. The only drawback so far is that we haven’t found a tavern that is convenient to the recording studio. 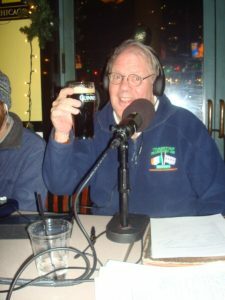 We do the show from WCEV on west Belmont, just west of Laramie and we’ve had a hard time finding a joint where we can have a post-show gargle. Marty Mullarkey, the concierge at McCormick Place, took us to McMahons on Irving Park Road a few weeks back but that is still a hike from our spot on Belmont. We visited a joint on Belmont one night after the show and thought we had just walked into a horror movie. There were some zombies playing pool and the whole joint stopped talking when we walked in and gave us the eyeball. I could see bugs crawling around on the inside of the beer glasses, and those were the clean ones! In the weeks to come, Skinny and I will be giving our take on the upcoming mayoral election as well as aldermanic races in selected wards. We’ll also bring in some guests who can enlighten us regarding the same. And we’ll make sure to continue to shout “Who Cares” during our weekly celebrity spotlight and give you the news on who is newly dead in our obit segment. Also, if you have an event you want us to plug on the air, email us and we’ll try and fit it into our “55 minutes of madness”. Please only send info on events that will benefit somebody in need, not some get rich quick scheme you’ve got up your sleeve. Believe me, I’ve got plenty of those of my own. By the way, please come to the Beverly Art Center on Saturday night January 8th to see my new film, “Her Majesty, ‘da Queen”. It’s a very funny sneak peek backstage at Chicago’s annual St. Patrick’s Day Parade Queen Contest. The film is only an hour and we’ll have some laughs and refreshments after the show in the Atrium of the BAC. The Beverly Art Center is located at 2407 West 111th Street in Chicago, on the southwest corner of 111th and Western. Free parking. For tickets and more information call 773-445-3838. Please remember our sponsors, Flood Brothers Disposal and Hawthorne Racecourse. We couldn’t do the show without their help, our pals Bob Flood and Tim Carey at Hawthorne. I’m encouraging all of you to play the horses at Hawthorne, win a ton of dough, and make a huge mess and have Flood Bros. haul the trash away. Please keep tuning in to the show every Saturday afternoon at 3:05PM, keep calling in at 773-777-1450, and keep telling your friends about this ground-breaking show in broadcast history! Spread the word to your pals by steering them to our podcasts. Thanks and Merry Christmas and Happy New Year and God Bless all of you!